Stewart Cameron was a beloved balladeer and storyteller with an undeniable passion for ancient stories, whether told or sung. He was able to bring them alive for all who were lucky enough to see and hear him perform. He performed regularly at folk and storytelling festivals in Ontario in the 1970s and 1980s. Sadly, he died young without ever having made a professional recording. 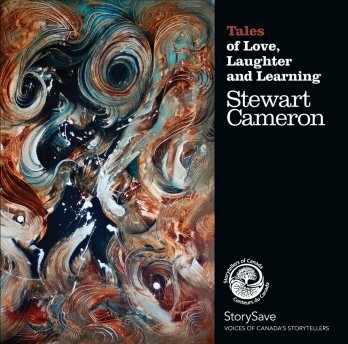 StorySave is pleased to present two CDs of Stewart’s work: Tales of Love, Laughter and Learning, and its companion, Ballads of Love, Laughter and Learning. The pair were put together from refurbished archive material spanning a decade to ensure that the magic of his unforgettable talent can be heard and enjoyed once more. Stewart Cameron, was born in Scotland in 1947. His parents, Duncan (a native of Scotland) and Muriel (originally from Halifax, Canada) moved to Ajax, Ontario when he turned 1. Growing up, Stewart learned to paint and write songs in a style reminiscent of Bob Dylan. He became involved in performing traditional ballads and stories as an adult living in Toronto. He was a member of the Friends of Fiddler’s Green folk band, and was a regular at 1001 Friday Nights of Storytelling. In the mid-1980s, he moved to Sudbury, Ontario, where he produced several Cable TV shows on storytelling and ballads. Stew died in 1989 of cancer, never having officially recorded his repertoire. His tradition of ballad singing and storytelling carried on by his daughter, Moira, and his son, Duncan. This recording is their tribute to his legacy. These stories have been digitally remastered from Cable TV shows Stew participated in or produced in Sudbury between 1983 and 1984. Many were told as part of an interview with storyteller/writer Sonja Dunn; her voice is heard on one of the tracks. Some tracks are clips of Stew talking about different aspects of storytelling. The entire shows are available on YouTube. The sound quality is all mono and may include background noise, however the quality and energy of the performances is unquestionably impressive. This is the companion to a second StorySave CD: Ballads of Love, Laughter and Learning. To purchase the Tales of Love, Laughter and Learning CD, click here. For more about Stew, click here.